What Are the Keys To Financial Success? When Richard Paul Evans was twelve, his father, a building contractor, shattered both his legs. With no insurance, no income, and eight children, the family was destitute. 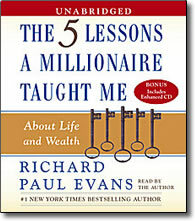 At that difficult time young Evans was introduced to a kind multimillionaire who taught him the five secrets of wealth. Today, Evans credits those lessons not just with bringing him wealth and success but also bringing him freedom and opportunity in a world where financial slavery is ubiquitous. In his signature motivational voice, Evans interweaves those influential lessons with personal stories from everyday people. He explains that money should not be the preoccupation of our lives. Rather, if we follow the five principles, we will be free to focus on God, family, and relationships — the true nourishments of life. Wise and compelling, The Five Lessons a Millionaire Taught Me About Life and Wealth will leave you with a new view of what it means to be rich — and convinced that you, too, can build wealth. The Five Lessons a Millionaire Taught Me is endorsed by financial consultants, churches, schools, and marriage counselors. You cannot afford to be without this audiobook.